You religiously follow your CTM routine without fail to make your face glow. But how often you show this extra love and care to your feet? Just like your face, your feet too get tired after a long and busy day. And they need extra care and attention to look their best. I understand that it’s impossible to go for a foot spa almost every week. But what if you could give them that royal treatment right at home? In this article, I have compiled a list of simple and easy DIY foot scrubs. But before we proceed, let’s try to understand how exactly a relaxing foot scrub or foot massage is going to help you. It boosts blood circulation in your feet, which helps relieve aches. Massaging your feet with a scrub relaxes your mind, body, and spirit, thus relieving stress. Your feet look amazing because the foot scrub gently exfoliates and removes all the dirt and dead skin cells. It soothes foot pain and discomfort due to walking or standing for long hours. Your feet take the beating every day. So, why not shower them with some love? 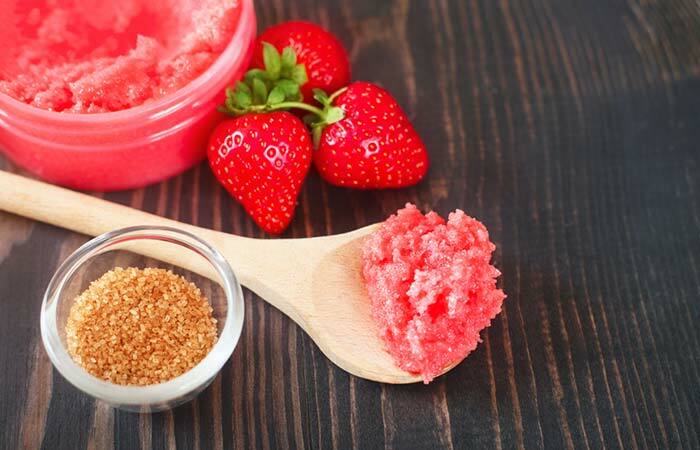 Here are some DIY recipes for amazing foot scrubs. Add the salt to a large bowl and mix well with coconut and olive oils. Add the peppermint oil and rosemary. Mix well. If it’s too dry, add more coconut and olive oils. If you have dry skin, try this homemade scrub. Rosemary is ideal for relieving aches and rejuvenating the skin on your feet. When applied on a regular basis, it removes tan and blemishes and makes your feet glow. Peppermint oil helps in relieving aches and pain. Mash the strawberries and mix the sugar in it. Apply the scrub to your feet and wait for 20 minutes before washing. 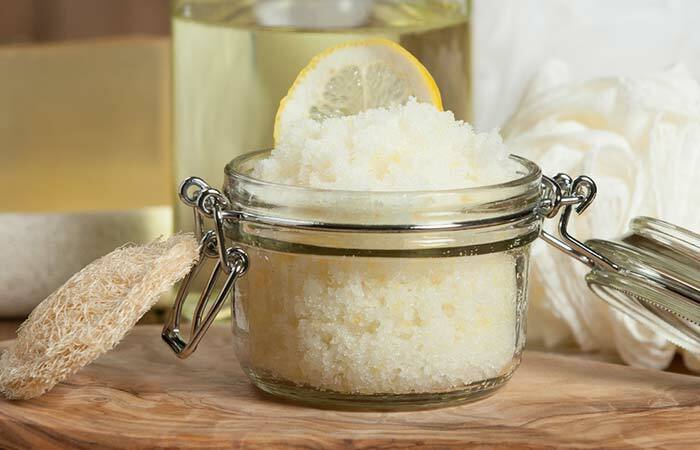 This foot scrub looks delicious and has a sweet aroma that’s invigorating. It is suitable for all skin types. Strawberries have anti-aging properties and are great for preventing cracked heels. They soften the skin on your feet and protect them from UV rays. Mix all the ingredients in a bowl and transfer to a glass jar. 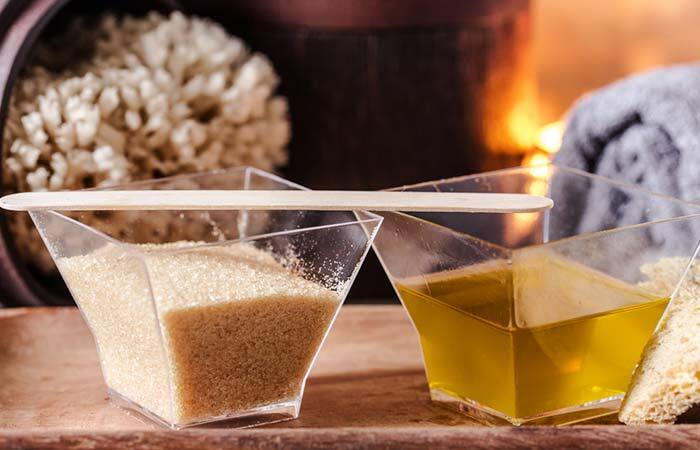 Scrub your feet for 10 minutes with this mixture. Leave it on for another 10 minutes. Wash and follow up with a moisturizer. Peppermint oil is antiseptic and antimicrobial. It relieves aches and pain while coconut/olive oil softens the feet and moisturizes them. This scrub is great for tired feet and is suited for all skin types. Do a patch test before using peppermint oil. Mix all the ingredients in a bowl and store it in a jar. Keep it aside for a few days. Use the mixture to scrub your feet gently for at least 20 minutes. This is the best DIY foot scrub for cracked heels. It is safe for all skin types and rejuvenates your feet. Coconut oil is excellent for healing many skin conditions. It slows down aging and makes the skin smooth. Note: You can omit the vitamin E oil if you want. Add the salt to a bowl and mix well with the buds. Add the lavender and grapeseed oils to this and blend. Damp your feet and gently massage the scrub on them. Leave it on for 10-15 minutes and then wash it off. Lavender has antiseptic and anti-inflammatory properties and keeps many skin issues at bay. It also has a calming effect that induces relaxation. Combine the sugar, olive oil, and baking soda in a bowl. Add the essential oil and scrub your feet with the mixture. Leave it on for at least 20 minutes and then wash it off. This is the simplest of all DIY foot scrubs, but it does an amazing job of keeping your feet happy. It is extremely gentle, and the essential oils comfort your feet. Make a thick paste by mixing the baking soda and water. Apply it to your feet and massage for 10 minutes. This is another easy-to-prepare foot scrub for tired feet. Baking soda not only relieves aches and pain but also fights toenail fungus. Note: You can soak your feet in baking soda mixed with warm water and then follow up with this foot scrub. Mix all the ingredients and prepare a thick paste. Apply it all over your feet and massage for 15-20 minutes. 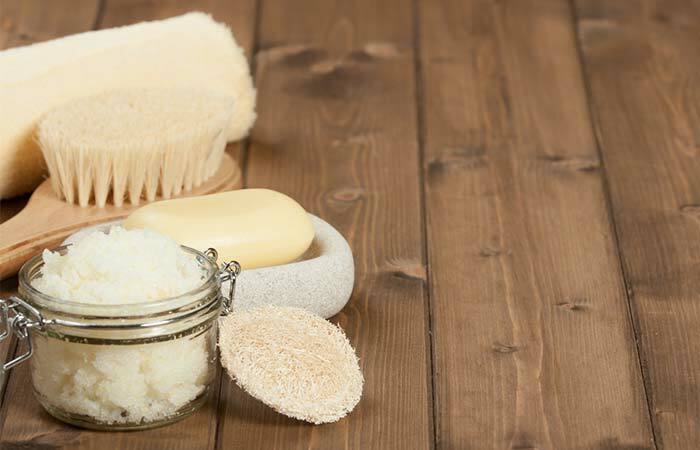 This DIY homemade foot scrub enhances the texture of the skin on your feet. The coffee grounds have anti-inflammatory properties, which help relieve swelling and pain. Massaging helps improve blood circulation in your feet. Combine the sea salt and the oils in a bowl until you get a paste. Apply the paste on your feet and scrub for 10 minutes. The essential oils soothe your feet and kill any bacteria and germs present on them. Note: If you have cracked heels, the essential oils might sting a bit. But there is nothing to worry. Mix the bath salt and honey in a bowl. Add the essential oil to this and blend well. Apply the paste to your feet and gently massage for 10 minutes. Soak your feet in warm water with bath salt. 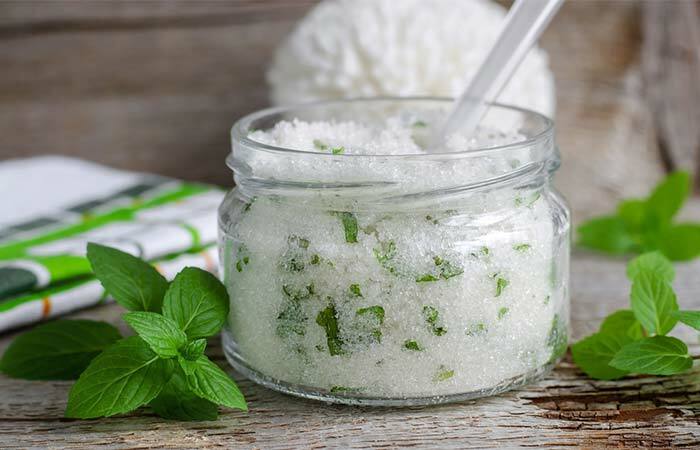 This DIY foot scrub is excellent for rough skin and suits all skin types. Camphor oil is an excellent disinfectant, nerve pacifier, and antiseptic. Honey makes your feet soft and rejuvenates them. Mix the sugar and bath salt in a bowl and add the olive/coconut oil to it. Add the essential oil at the end so that it is evenly distributed. Apply the scrub to your feet and massage for 15 minutes. Leave it on for some time (a few minutes) and then wash it off. The smell of lemon is very rejuvenating, and the scrub feels great on the feet. Honey works wonders in making your feet skin softer than ever. Mix all the ingredients, except the essential oil, in a bowl. Scrub your feet with the mixture for 10 minutes and then wash with water. This foot scrub is best for those who are suffering from skin issues on the feet. Magnesium is absorbed instantly when applied topically. It relieves pain, soothes your aching muscles, and also treats any skin conditions such as psoriasis and eczema. Note: You can use Epsom salt if you don’t find magnesium salt. 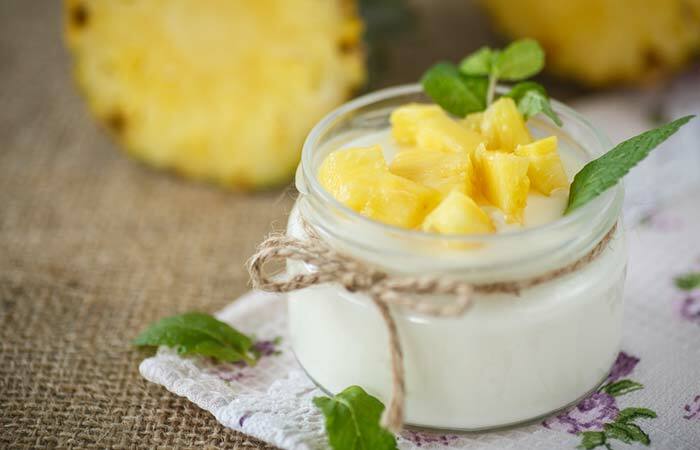 Mix the sugar and yogurt in a bowl and then add the pineapple to it. Massage the scrub on your feet for 10 minutes. Leave it on for another 10 minutes. Pineapple is an excellent source of vitamin C and has enzymes that exfoliate dead skin cells. Yogurt brightens the skin and improves the texture. Pour the milk and water in a pedicure basin and soak your feet in it for 15 minutes. 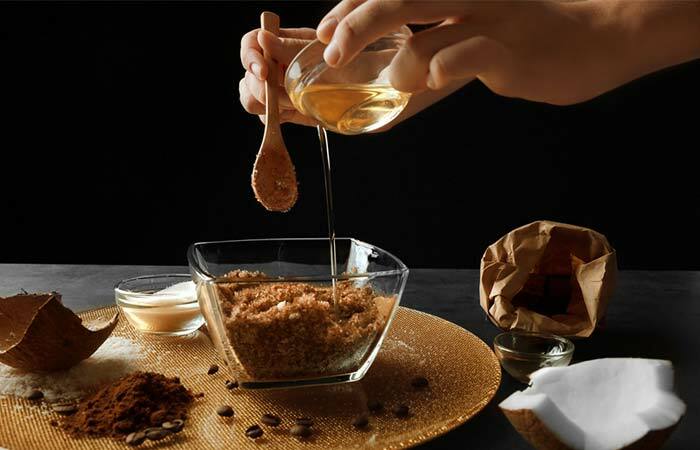 Mix the granulated sugar with oil. Remove your feet and scrub them thoroughly with the oil and sugar paste. Wash it off. Massage with coconut oil and put on your socks. The lactic acid in the milk breaks down the dead skin cells, and the scrub gently exfoliates your feet. The milk fat and coconut oil moisturize your feet. Whisk the coconut oil until it’s a bit fluffy. Add the sugar and vanilla seeds to it and mix. Apply the mixture to your feet and scrub for 10 minutes. Leave it on for another 10 minutes and then wash it off. This scrub soothes any skin irritation, removes dead skin cells, and moisturizes the feet. Coconut oil works like magic on your skin. 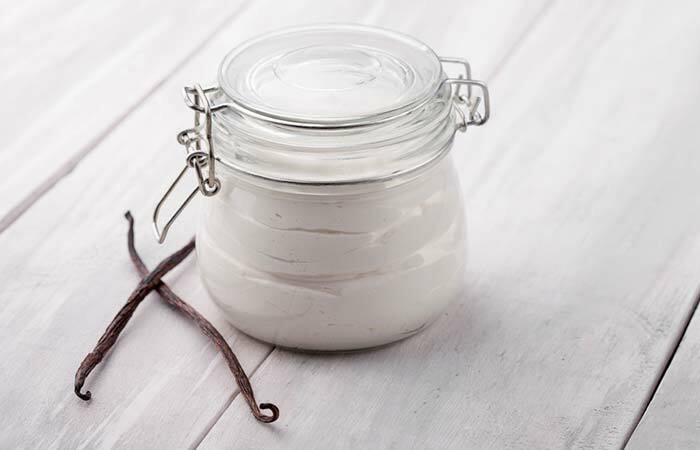 Vanilla is a relaxant and is rich in antioxidants that keep your feet infection-free. Mix all the ingredients in a bowl and make a paste. Apply the paste to your feet and scrub for 10 minutes. Wash and follow it up with a moisturizer. Oatmeal is a great exfoliator, and when combined with bath salt and baking soda, it softens the skin on your feet and soothes rashes and itches. Combine the sugar and coconut oil in a bowl. Massage the scrub all over your feet for 5 minutes and leave it on for 15-20 minutes. Wash your feet and apply cream or moisturizer. Any citrus smell is known to rejuvenate your senses, and this foot scrub not only makes your feet smell great but also rejuvenates them. 1. Combine the sugar and olive oil in a bowl. 2. Add the peach essential oil drops and mix well. 3. Apply the mixture to your feet and scrub for 10 minutes. 4. Let it sit for another 15-20 minutes and then wash it off. 5. Follow it up with a moisturizer. 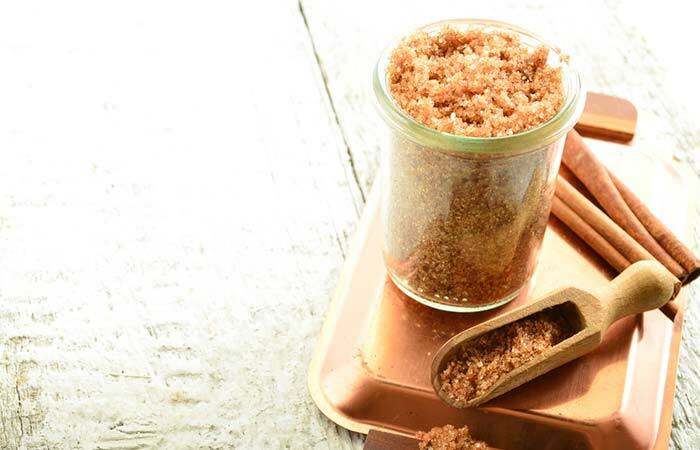 This scrub looks (and smells) delicious and is easy to prepare. Peach oil is extremely comforting to the skin, and sugar is an excellent exfoliant. Mix the sugars in a bowl. Blend well and add coconut oil. Scrub your feet with the mixture for 10-15 minutes and then wash. It smells great, pampers your feet, and smoothens the tough spots. It’s great for all skin types. Mix the sugar, coconut oil, and lemon essential oil in a bowl. You may add lemon zest if you want (for additional scent and color). Apply the scrub to your feet and exfoliate. Lemon clears any blemishes from the skin, and sugar scrubs the dead skin cells off. Coconut oil moisturizes your feet and makes them soft. Forget hitting the spa everytime you need a foot massage. With these DIY methods, prepare a relaxing foot scrub at home and pamper your feet to conquer the world. Try these scrubs and let me know whether your feet loved them or not. You can leave a comment right below. Keep following us for more such tips and DIY routines. How long these DIY foot scrubs last? Since these foot scrubs are natural and do not contain any preservatives, they won’t last long. If you are storing them, make sure to use them within 3 weeks or a month (maximum). What’s the best time to use a foot scrub? During the showers. You can also use it after coming back from work and before hitting the bed. Your feet can soak the maximum effects of the moisturization. Can these foot scrubs be given as gifts? Of course! Store the scrub in an airtight glass jar and decorate it before presenting it to someone. How often should someone use foot scrubs? Twice a week is fine. Can these scrubs be used on the face? Absolutely not! These are extremely harsh on the facial skin. But you can use them on your hands. Can scrubbing harm the skin? These are made of natural ingredients and hence will not harm your skin. But, if you use them excessively (more than twice in a week), they might scrape the skin.